Solar Panels 325Wp x 9 nos. Kstar Grid-tied Inverter - 1 no. The rate of electricity has been increasing at an alarming rate of 10% Y-o-Y. A wonderful way to reduce your electricity bills is by generating your own Electricity through Solar, right on your own rooftop. 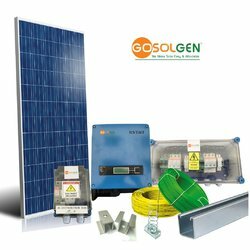 GOSOLGEN is a Grid-tied Solar Electricity Generator that helps you reduce your electricity bills and also ensures you independence from the rising electricity cost. The output of the Solar generation will be available on your computer as well as mobile App. Inverter has Wifi or GPRS stick for measuring all electrical quantities such as Voltage, Current, Frequency of different Phase & energy (kWh) generated by the Solar. This data can be seen real-time and past history in visually appealing format. Customer should get Solar panels cleaned from time to time to ensure optimum power generation from the solar equipment. Customer should ensure that the Solar equipment is protected from any damage due to negligence. 2. Grid-tied Solar requires Netmeter to be setup by your DISCOM and will be charged separately. Please share your electricity bill to us at info@gosolgen.com so that we can estimate the cost.